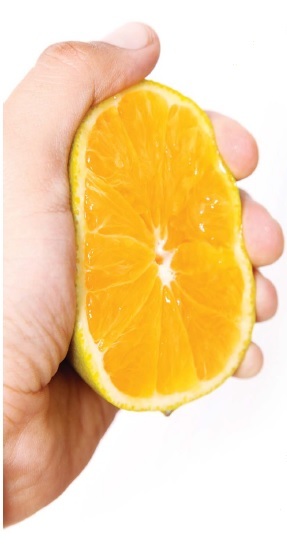 When you squeeze an orange, what do you get? Orange juice. Because that’s what is in the orange. When you are squeezed, what comes out of you? What comes out of you is what is inside of you. If you become angry, or envious, or jealous, when squeezed, it is not the fault of the person who squeezed you. It simply means the person activated what was already inside of you. They were just the catalyst. The following story illustrates this point and sets an inspiring example for us. A sadhu (renounced saint) was having a bath on the edge of a flooded river. Because of the flood one scorpion had ended up in the river and was floating by him desperately trying to reach the river bank. Seeing that the scorpion might die, and feeling compassion for him, the sadhu picked up the scorpion to carry him out of the water. Immediately the scorpion bit him with a piercing poisonous bite. Unmindful of the bite, the sadhu again picked up the scorpion. But again the scorpion bit his hand. This happened many times as the sadhu walked towards the shore to put the scorpion on dry land. When the sadhu was squeezed, what came out of him was kindness because kindness was inside of him. Of course, it can be difficult to admit that the person who “disturbs” us is not the cause of the disturbance, and our response to situations is not determined by what is around us; it is determined by what is inside of us. Here is an interesting story that illustrates this point. Things outside of us don’t fundamentally change who we are. What ultimately changes us most is coming to spiritual awareness. What is most valuable is what is inside of us. The following story beautifully illustrates this fact. There was a poor woman who lived as a simple renunciate in the Himalayas. By God’s grace, she found a precious stone one day as she was planting vegetables. The value of this stone was enough to get her out of poverty and provide her needs for the rest of her life. Later that day, a hungry man saw she had bread in her bag and asked her some. When she opened her bag to give him some of her bread, he saw the precious stone. Knowing the value of the stone, and knowing that she was renounced, he decided to ask her for that stone. She unhesitatingly gave it to him and he graciously received it. The man soon realized that this humble woman had something much more valuable than that precious stone. He returned the stone and made another request of her. “Would you please give me what it is inside of you that enabled you to give me this stone? That is what I lack and truly want. I can see that you possess the greatest wealth. What is inside of you? Is it greed, anger, or envy? Or is it compassion, kindness, and love? Most of us have both, but one tends to predominate, as illustrated in the following story. One evening an old Cherokee Indian told his grandson about a battle that goes on inside people. He said, “My son, the battle is between two “wolves” inside us all. One wolf is Evil – it is anger, envy, jealousy, sorrow, regret, greed, arrogance, self-pity, guilt, resentment, inferiority, lies, false pride, superiority, and ego. We have a higher spiritual nature and a lower physical nature. When we live on the material plane, qualities such as greed, envy and resentment tend to predominate. Thus we carry the toxic influence of these qualities in our heart and suffer from its poison. It is nothing less than self inflicted pain and punishment. But as we cultivate thoughts and actions in line with spirit, higher spiritual qualities such as compassion, forgiveness and service manifest. Developing these qualities are their own rewards, because as they manifest in our heart we experience them, live by them, and radiate them to others. What comes out of you is what’s inside of you.